If you're searching for a family-friendly vehicle with style, space and safety in spades, you'll find the 2019 Volkswagen Atlas SUV is the complete package for your everyday adventures around New England. 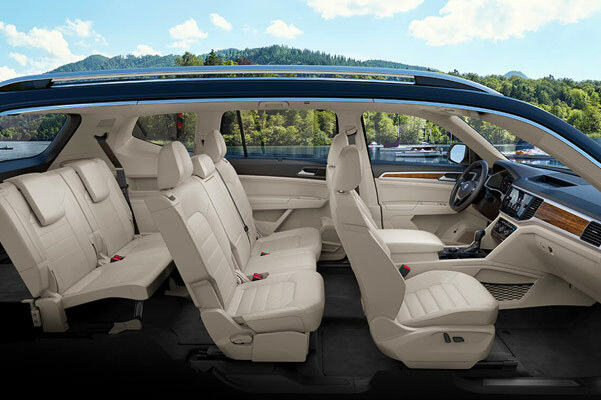 From the 2019 Atlas interior features to the 2019 VW Atlas V6 SE performance options, this new Volkswagen SUV has a variety of cabin comforts and amenities the entire crew will enjoy. Schedule a test-drive at our Volkswagen dealership near Hartford, CT, and ask our team about the 2019 Atlas updates, price and more. Come view the 2019 Volkswagen Atlas lease and finance offers available now at Gene Langan Volkswagen Glastonbury! If you're interested in financing a 2019 Volkswagen Atlas SUV, come explore the 2019 Atlas lease options, price and Atlas trims at our Connecticut Volkswagen dealer. From the 2019 VW Atlas V6 SEL R-Line to the Atlas 4MOTION® all-wheel-drive SUVs, we have just what you need at Gene Langan Volkswagen Glastonbury.